Action: Drive Erich Zann insane to choose an opponent’s non–Ancient One character. Trigger that character’s ability as if you were its controller, ignoring all costs. 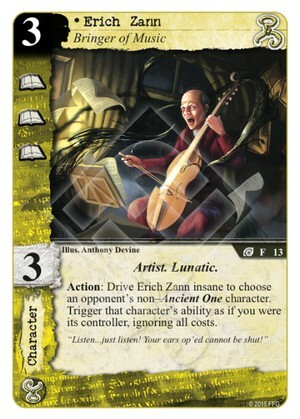 The amount of damage this version of Erich Zahn can do is significant, even more with an Arkham Asylum around. Turning the opponent's characters abilities against him, without paying anything from your domains, is scary. That being said many great abilities are Responses or Forced Responses and since Erich's ability is not Interrupt, I suspect he won't be able to trigger those.